I seldom, if ever, pray to Jesus. I’m not worthy. But I always pray to Mary because she is close to Jesus and even if he will not hear me, I know he will listen to her prayers. 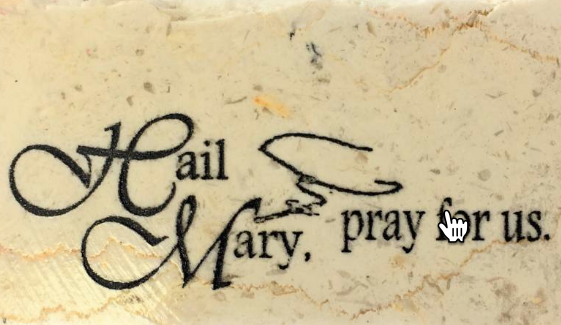 Is it just me, or does it seem like everyone has a Catholic mom, aunt, grandma, or a distant relative who told them that they always pray to Mary, and seldom (or in some cases, never) pray to Jesus? When my wife attended a Catholic retreat shortly after we began our journey of reconciliation, the retreat leaders were exhorting the women in attendance to deepen their prayer lives in communion with the Trinity. One of the women in the group told my wife, “Wow! All these years I never knew I could pray directly to Jesus.” How sad! And again, that is not because of the official teaching of the Roman Catholic Church. It’s because that woman received horrible catechesis when she was younger, and it is likely that those erroneous ideas were reinforced by family members and fellow Catholics who also did not know better. Thank God she was told by well-taught Catholics that such ideas are absolutely false. And how wonderful that she left that weekend renewed in her faith, and in full confidence that she could pray directly to The Father, Son, and Holy Spirit. As I continue to stress (and will do so over and over and over and over again) if you want to know, or accurately represent to others what the RCC teaches, you must first go to and give a fair reading to the Catechism, and not your ex-Catholic friend, anti-Catholic pastor or cousin, or your poorly-catechized Catholic friend at work. There are a total of 307 of the 2,865 articles (that’s about one in nine articles) in the CCC are specifically about prayer, so the pastors and teachers of the Catholic faith definitely want Catholics to pray. The subject occupies the entire last section of the Catechism (Articles 2558-2865). Here is a very small sampling of excerpts of what the Catechism says to encourage prayer directly to the Father, His Son, Jesus Christ, and Holy Spirit. 2616 Prayer to Jesus is answered by him already during his ministry, through signs that anticipate the power of his death and Resurrection: Jesus hears the prayer of faith… [p. 629]. 2664 There is no other way of Christian prayer than Christ. Whether our prayer is communal or personal, vocal or interior, it has access to the Father only if we pray “in the name” of Jesus. The sacred humanity of Jesus is therefore the way by which the Holy Spirit teaches us to pray to God our Father. [p. 640]. 2665 The prayer of the Church, nourished by the Word of God and the celebration of the liturgy, teaches us to pray to the Lord Jesus… [p. 640]. 2670 “No one can say ‘Jesus is Lord’ except by the Holy Spirit.” Every time we begin to pray to Jesus it is the Holy Spirit who draws us on the way of prayer by his prevenient grace. Since he teaches us to pray by recalling Christ, how could we not pray to the Spirit too? That is why the Church invites us to call upon the Holy Spirit every day, especially at the beginning and the end of every important action. [p. 641]. No more proof is needed (but much more is available to anyone who wants to be honest and fair to the official teaching of the Roman Catholic Church). Well-taught Catholics are encouraged by the teaching office of the Church, by good pastors, and by faithful fellow Catholics to pray to the Father, the Son, and the Holy Spirit. There are hundreds and hundreds of written prayers in more prayer books than I can count for Catholics to learn to pray to the Triune God. I don’t let people tell me that Catholics can’t pray directly to God, or that the RCC teaches them not to. It’s a slanderous lie at worst, and at best, it is a statement of total ignorance! Neither is acceptable now that you have seen with your own eyes what the Catechism plainly teaches. Every time I have been to a Catholic Mass I have stood with my hands lifted in prayer next to fellow Catholics as we all pray with one voice, “Our Father who art in heaven…” Yes, most every Catholic raises their hands to the Lord during the Lord’s prayer. Go to a Mass and see for yourself! Every time I have prayed the Rosary (which is often since I began my journey), I have prayed the Our Father (a prayer to the Father), the Glory Be (a prayer to the Holy Trinity), and the Fatima Prayer (a prayer to Jesus for mercy, salvation from the fires of hell, and entry into heaven, which only he can accomplish) multiple times. 2673 In prayer the Holy Spirit unites us to the person of the only Son, in his glorified humanity, through which and in which our filial prayer unites us in the Church with the Mother of Jesus [p. 642]. you have approached Mount Zion and the city of the living God, the heavenly Jerusalem, and countless angels in festal gathering, 23 and the assembly of the firstborn enrolled in heaven, and God the judge of all, and the spirits of the just made perfect, 24 and Jesus, the mediator of a new covenant, and the sprinkled blood that speaks more eloquently than that of Abel. It is at this point that many “bible-only” Christians (who often don’t realize that they actually got their Bibles from the Church — for it is the church that has preserved the text of the Bible, and tells them what the Bible actually is) will say, “Yes, I understand all that, but there’s just no proof that anyone in the Bible — especially in the New Testament — ever prayed to the saints, or to Mary. This will be a bit of a painstaking exercise, but it needs to be done here, because we need to be reminded of how the Church of Jesus Christ has done a lot of theology over the past 2,019 years. When I first became a Christian I argued a lot with Mormons who deny the doctrine of the Trinity as it is formulated in the Nicene Creed. In fact, Mormons call the Nicene Creed an abomination (along with every other creed). The five-fold methodology in the Mormon argument against the Trinity is exactly the same as the protesting argument against the Catholic view of the Communion of Saints. The doctrine is a later formulation, and wasn’t even formalized until over 325 years after Jesus rose from the grave in an eccumenical church council which was convened by the Roman Emperor, Constantine. But when I would talk to my Christian friends about this they were resolute. “It doesn’t matter,” they would tell me, “because the doctrine itself is easy to formulate if you’re paying attention to what is said in Scripture.” In other words, they believed that we had to “do theology” in order to put the doctrine of the Trinity together. Guess what — they’re right! I agree! In fact, Christians will tell you that you are not really a Christian if you don’t believe in this doctrine whose namesake (and some of the language used within its formulations) are not found in the Bible. The church even had to invent a word that is nowhere to be found in the Bible to communicate the doctrine of the trinity (homoousios, which is translated as consubstantial or “of one and the same substance” in the creed). One hundred dollars to the first person who can find this word (which is part of “essential Christianity”) anywhere in the Bible. You can’t. It’s not in the Bible anywhere. So, bible-only protesting Christian, are you ready to give up the doctrine of the Trinity yet? Will you fairly and consistently apply your methodology with respect to the rejection of the communion of saints (the same methodology used by Mormons to reject the trinity) to the Nicene creed? If not, why not? Why the picking and choosing which things to believe that are not found explicitly stated in the Bible? Why the inconsistency if things must be explicitly stated in the Bible in order to be true? Stick with me here because I want to push on this point even harder. Kenny, it’s easy, look; The Bible says there is only one God, right? And it says that the Father is God, right? And it says that the Son is God, right? And it says that the Holy Spirit is God, right? And it also seems evident that the Father is not the Son or the Spirit, and the Spirit is not the Son or the Father, and the Son is not the Father or the Spirit (proof texts abound as we’re going along here). So, you can see that even though the word is not used, and even though Jesus never explicitly formulated things this way, and even though the Apostles never used the credal formulations or said we have to believe this, it’s pretty obvious, isn’t it? I mean, it just follows that this must be true based on everything as you put it all together, right? As an aside, I also find it ironic that these same doctrinal statements will typically begin with something like, “The Bible is the infallible and authoritative word of God and the final court of appeal in all matters of faith and conduct.” The reason I say it’s ironic is that the final court of appeal never uses the word Trinity, and never tells you what even goes in the Bible. I mean, where does it say anywhere in the Bible that, say, the book of Jude or the Gospel of John get to be in the Bible? What verse or chapter in the Bible contains a table of contents for what gets to be in the Bible? No, we get the Bible from the Church. We get the doctrine of the Trinity from the Church as it rightly interprets and teaches us the Bible. If I say that the book of Jude should not be in the Bible, which text in the final court of appeal will you use to tell me I’m wrong? It can’t be done. You’ll have to appeal to tradition and to the Fathers. No way around it! I’m being dead serious, dear protesting Christian. Show me this in the Bible. Where in the Bible is the exact terminology used in your church’s doctrinal statement for the doctrine of the Trinity? Be fair. Be honest. It’s not there, is it? No. But yet, when we “do theology” by opening the Scriptures and taking them together in their proper context, and when we listen to the wisdom of the Church (the pillar and ground of the Truth, 1 Tim. 3:15) the conclusion is unmistakable. The Trinity is taught in the Bible, and it took Christians 325 years to talk about it the way we do today. What’s the point here? It takes time to formulate our theology. The Catholic Church teaches emphatically that there is no new revelation (cf. CCC Articles 66-73) . God’s final word and full self-disclosure is Jesus Christ. But it is also obvious that there have always been new ways that the Church has learned to talk about what has already been revealed and what may have been right in front of their eyes all along. It is easy to see in the writings of the early Fathers that they believed in the Trinity before it was the dogmatic teaching of the Church. In the same way, you can also find throughout the writings of the Church Fathers that they believed in (because of what they saw in the Bible) the communion of Saints, and that they were, indeed, praying with (and believed that Christians could and should ask for prayer from) the Saints in Heaven. Show me in the Bible where Jesus or the Apostles ever used the word Trinity or Homoousious. You are not allowed to cite anything outside of the Bible, including the writings of Church Fathers. Use your “illative sense” and you’ll see it. It’s right before your eyes! The Bible teaches that angels and Saints carry the prayers of God’s people to God (Rev. 5:8, and 8:1-4). The Bible teaches that the effective and fervent prayer of a righteous person does much good, and those who have died in Christ are called “the Spirits of the just made perfect” (James 5:16 and Heb. 12:23). When we are praying, we are in the Temple of the Holy Spirit, the Body of the Lord Jesus, and are thus praying with, and in the communion of the Saints and Angels in heaven. And if Saints and Angels carry our prayers up to God’s throne, that we may ask them, through the mediation of the Holy Spirit, to intercede for us. And if there was ever a Saint of whom it must be said that she is in God’s presence in the communion of Saints, it is Mary, the Blessed Virgin. Catholic Church, Catechism of the Catholic Church, 2nd Ed. (Washington, DC: United States Catholic Conference, 2000), 615. Peter S. Williamson, Revelation, ed. Mary Healy, Catholic Commentary on Sacred Scripture (Grand Rapids, MI: Baker Academic, 2015), 228.